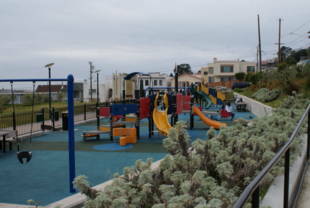 Ocean View Park/Playground is located in Ingleside and offers this neighborhood a large recreational open space. This park/playground has a small play structure with slides and swings, two baseball fields, two tennis courts, a soccer field, and a basketball court! The Minnie & Lovie Ward Recreation Center is a brand new recreation center for the community! The gymnasium is a freestanding building as is the community room and the teen building. Other multipurpose rooms, including arts and crafts room, preschool, kitchen and weight room, form the spine of the recreation center. A large central courtyard will function as an additional program space. Outdoor improvements include play structures for children and toddlers, a hillside slide, entry plaza, picnic and barbecue areas and paths for strollers and pedestrians. 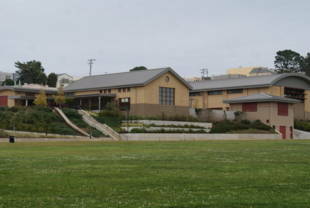 Ocean View Playground and Minnie & Lovie Ward Recreation Center are owned by the San Francisco Recreation and Park Department. 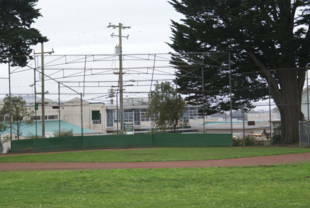 Facility phone number is (415) 337-4710. 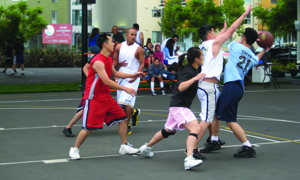 The park was renovated and the rec center constructed beginning in 2005, and was opened in June 2008. The rec center was named after Minnie and Lovie Lee Ward, an activist couple who co-founded the Ocean View-Merced Heights-Ingleside Neighbors In Action organization. The recreation center has a number of weekly activities. The free supervised after school drop in classes, for kids age 6-12, are held M-F from 2:00 PM to 6:00 PM. Classes include youth basketball, homework, youth shape-up, youth arts expression and arts & crafts. SFRPD family accounts are required for all classes. 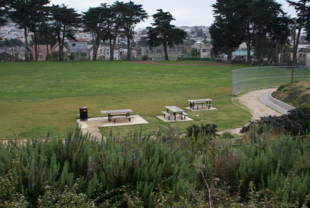 M-Ocean View: Plymouth and Broad stop; walk two short blocks north on Plymouth to Lobos St. and the park. ALSO: Plymouth and Capitol stop; walk two short blocks north on Capitol to Lobos St. and the park. 54-Felton: Plymouth and Montana stop or Plymouth and Lobos stop.